Oklahoma: Early this week I spent time around Stillwater, Lahoma (10 miles west of Enid), and Cherokee and Alva (north-central OK not far from the Kansas border). Wheat ranged from soft dough around Stillwater to milk at Alva (but quickly approaching dough). There is a big difference between the wheat in these areas; obviously wheat around Alva suffered more drought stress than Cherokee, which is worse than Lahoma or Stillwater. However, lots of moisture and cool temperatures are allowing wheat to fill and mature. As expected, leaf rust has exploded around Stillwater, with susceptible varieties such as OK Bullet at 80-90S. Leaves are gone on varieties that were highly susceptible to stripe rust, but varieties with stripe rust resistance that are susceptible to leaf rust (e.g., Jackpot, Greer) are now hit hard with leaf rust. Weather since the middle of April has been reminiscent of the weather in April and May of 2007. 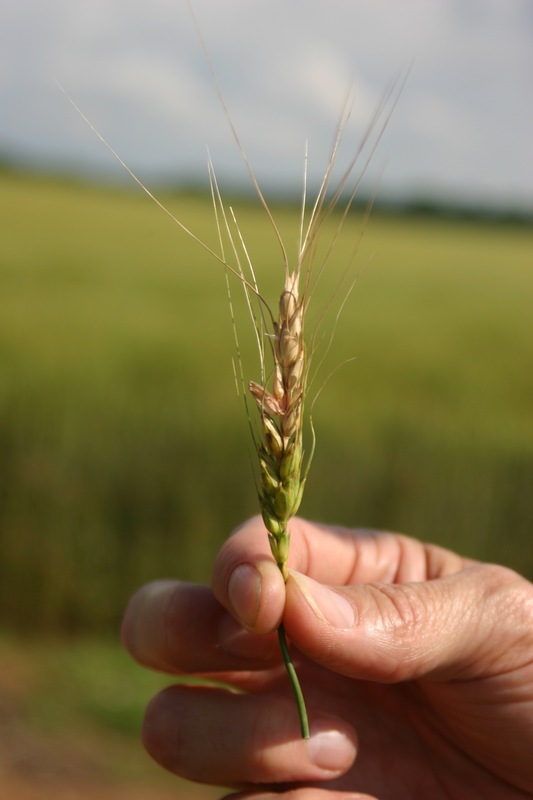 As a result, wheat diseases favored by cool and wet weather are starting to occur with increasing frequency and severity. These diseases are causing head discoloration, which can be caused by fungi or bacteria. Around Stillwater and Lahoma, head discoloration due to a bacterium (Xanthomonas) has been observed. l have had reports of similar symptoms on wheat in southwestern OK, where more rain has fallen then around Stillwater. This bacterial disease is called black chaff when on the heads and is called bacterial streak when symptoms are expressed on leaves. The fungi Septoria and Stagonospora also can cause head discoloration, and we have isolated Septoria from several samples during the last week or so. For a full discussion of the various causes of head discoloration along with pictures, clicking on the following link will take you to the e-Pest Alert sent out in June, 2007. 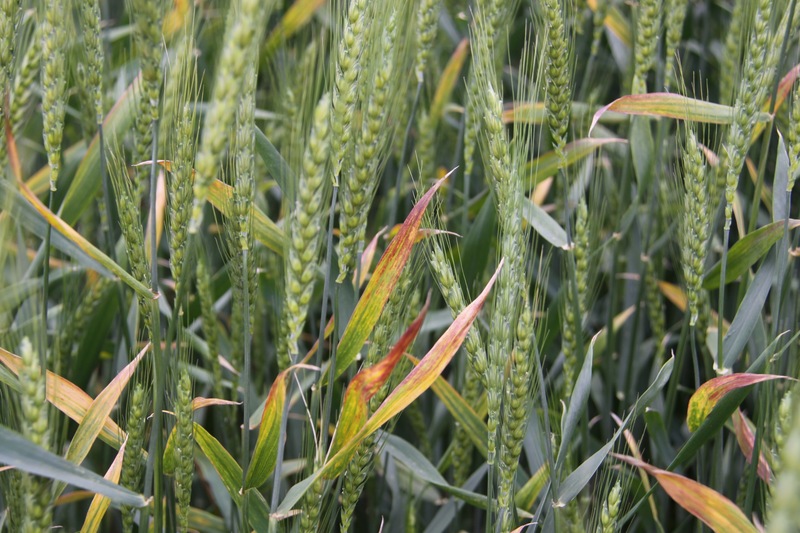 Barley yellow dwarf also was observed this past week, but it was not extensive and little to no stunting was associated with the BYD spots indicating infection most likely occurred in the spring. I have had reports of Fusarium head blight (scab) from southeastern KS, from Arkansas, and from eastern/northeastern OK, but have had no reports from anywhere else in Oklahoma. 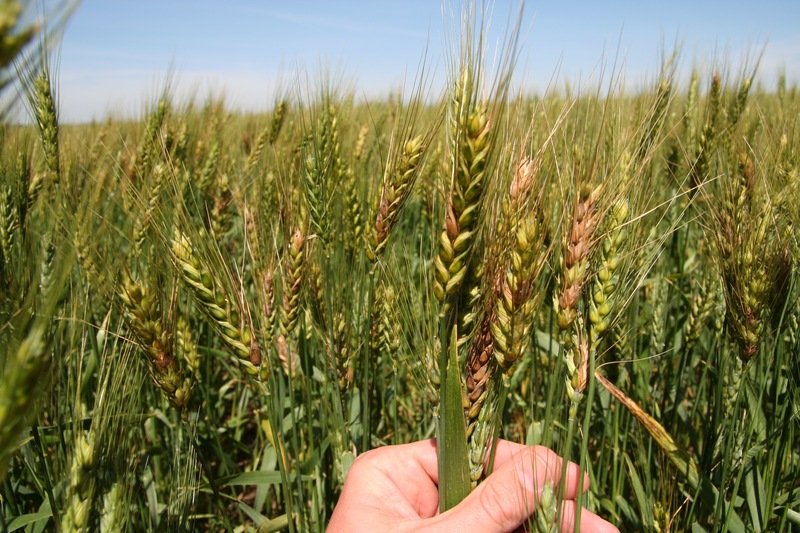 The diagnostic lab continued to receive multiple samples that tested positive for Wheat streak mosaic virus, with several also testing positive for High plains virus (Wheat mosaic virus) and Barley yellow dwarf virus. For information on mite-transmitted diseases, I refer you to EPP-7328 (Wheat Streak Mosaic, High Plains Disease, and Triticum Mosaic: Three Virus Diseases of Wheat in Oklahoma) also available at http://osufacts.okstate.edu. 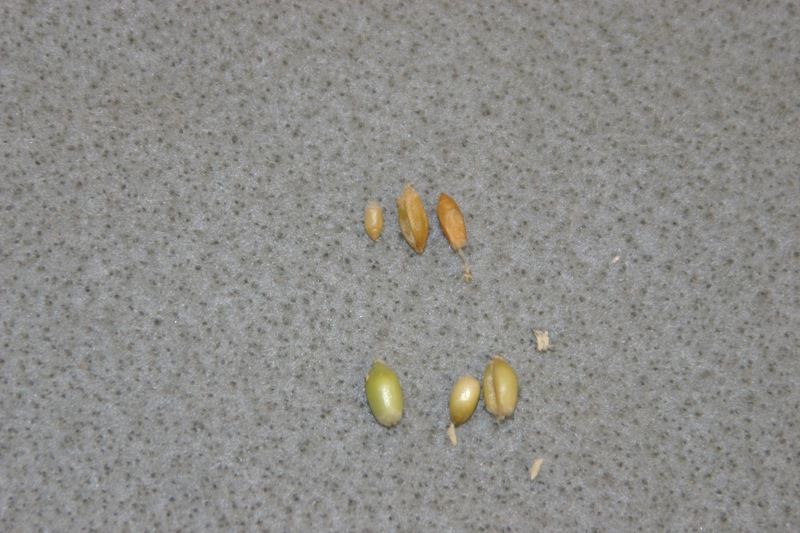 By osuwheat in Bob Hunger, disease on May 16, 2015 .